Now that the above advertisement has been published, I can finally let the proverbial cat out of the bag. The cat in this case being the news that I will be spending a good deal of 2011 illustrating the 25th anniversary edition of Clive Barker's Weaveworld. It will be published by Earthling, who I have worked with for a number of years on projects, illustrating the the writing of Christopher Golden, China Mieville and Jeffery Thomas. 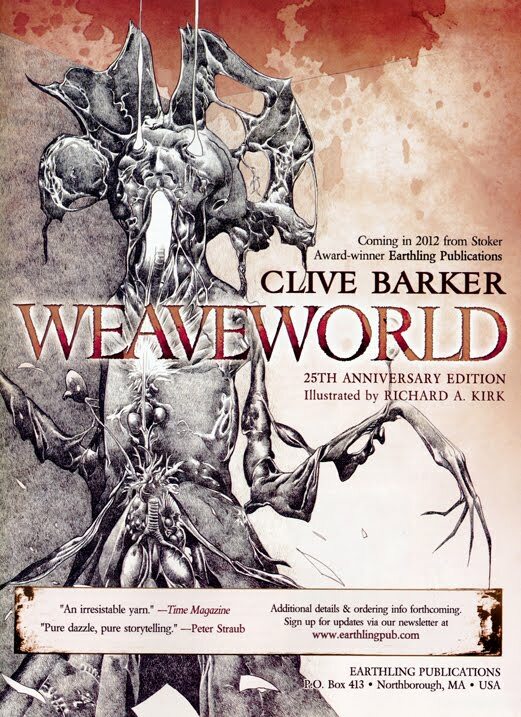 I read Weaveworld when it first came out in the mid 1980s, my first thought on finishing the book, was "man would I like to illustrate this thing." Actually there was an expletive in there but I'll spare you that detail. Well, now I am getting my shot. Can't wait. As many of you know, I've had the good fortune to work with Clive Barker on a number of projects. I think this will be the best yet! Other news (and apologies to my FB pals that have already heard this), issue 301 of Fangoria Magazine will carry a profile on my work written by David Goodfellow. David is an excellent writer and has done a great job of taking my ramblings and putting them into a nice coherent whole. There will be pictures with the profile of course, so check it out! Finally, I am very busy completing the first draft of The Red Lamprey, my next novel from Radiolaria Studios. I hope to have that done in early January when I will start the illustrations and begin the careful revisions, additions, deletions and so on. The story continues where The Lost Machine left off, but is an entirely new stand alone tale. My dear friend Hans Rueffert will be writing a foreword.